I just tossed the Bisner into a demo four-pack for fun. I normally play the the Beast 98. I plan to share my impressions. I played the Bisner during a 1.5 hour doubles clinic this morning. 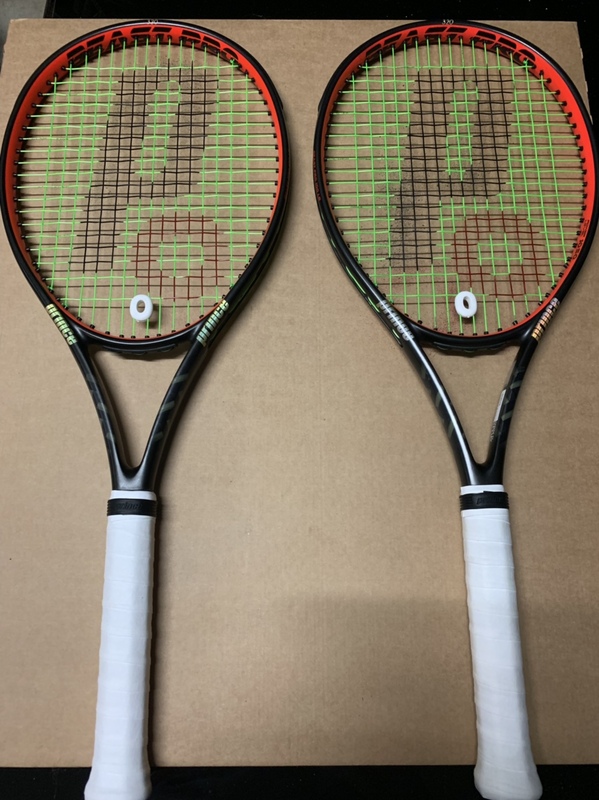 I specifically want to test my extended-length demos in the context of doubles, since my concerns are mostly about the handling inside the court. I'm sure I can baseline bash with almost any of them. In short, I made the not-so-surprising discovery that I'm a lot smaller and weaker than John Isner. Overall I played okay with it, probably due to it being somewhat similar to my Beast 98. However racquet head speed and preparation were definitely issues. I lost a lot of topspin and ended up blocking a lot of balls back because I wasn't able to get ready in time for a full swing. Most surprisingly, I feel like I lost velocity on my serve; I just couldn't get a full windup and maximum swing speed that easily. I did land a couple big overheads and forehands when the conditions were right, but I definitely can't handle this frame for full-time duty, especially not in doubles. I still really enjoyed getting the chance to check out John's big weapon. Yep, pretty massive weaponry alright - apologies to Big Bang Theory. I'm dying to try these Bisners...just orded two just based on your comments which are music to my hears. I always loved hefty rackets, played until recently with the ProStaff Classic 6.1 95 and I’m currently playing with a weighted (350g static) Burn CV 95 (the SW is probably 350 or more). Although I love the power of the Burn I find the sweetspot very small and a somewhat harsh. I’ve come to learn extended length rackets serve my game better. The beast will let me keep (probably increase) the power I love on the Burn and in theory it will give me a more ample sweetspot. Isner uses a 28" racquet. Thanks for your insight. Unless I string it low (44lbs or lower) the stringbed becomes very erratic on the Burn (powerful on center and harsh and low powered outside the sweetspot...the drop in power is sudden). How does it feel on the Bisner? More even? I'm a little bit concerned when you say way more power and tad less control, which makes perfect sense, but do you feel less confident going for the lines? Well crap, these are on clearance now. I guess I had better pick one up. I just bought a BISNER from TW and have had about 2 days of hitting with it. The first serve is sailing really long but I know that I am going to have to get the timing down. I do like the second serve lots of spin and height, ball really jumps. On grounds strokes this thing is really awesome, don't know if its the extra length or mass. Maybe both but the ball is deep and heavy, you do have to prepare a little earlier. I do feel it in my shoulder and trap on my right side, so could be due to how heavy the swing weight is. Overall the honeymoon period is going great. I really didn't have too much expectation going in because I didn't know how I would feel hitting with this frame. I really wanted to try this frame out and am really happy I gave this a try. Will be trying a small amount of lead at 3 and 9, but I like the stock weight. And it is easy to swing but is a little hard to maneuver for touch shots. If your a power player the grounds are really nice and slice is also really good. Just my 2 cents, I will update once I get more playing time with this frame. I've been using this Bisner for a month now (playing 7h week). I must say this not a good racket but a brilliant one. I'm amazed how good this racket is...it was totally unexpected to someone who always used thinner beam, small head size, control oriented rackets. I mean it’s not only the obvious power and the punch it packs (which is a lot) but everything else. The control is also great. Great playability out of the box and I find it very maneuverable due to its headlight balance. Last time I had this WoW feeling was when I started using the ProStaff Classic 6.1 which I used again in the anniversary edition not too long ago. I was in the market for a longer and heavy racket and after I shortlisted some, I decided for this Beast LB because it had the highest swing weight of all as I like that a lot in a racket. I’ve orded two from TW (this racket doesn’t exist anywhere else) strung with Dunlop Black Widow 17 @45lbs. Since I play two handed from both sides I felt it yet a little bit light weighted for what I’m used to and so I added 10g to 3&9. That’s my setup only for singles. For doubles, I use one in stock form since I need more racket head speed for serves and more maneuverability for volleys. The racket feels great in both setups. Like is to be expected, it serves and smashes huge and it is very powerful on groundstrokes. With the added weight I gained an even more heavier and penetrating ball. Like I’ve stated above, surprisingly it has great control and precision. Punch volleys come very easily and the solid feel is great but it lacks a little bit of touch, but not too bad. For the first time I feel no difference hitting on both wings (usually rackets either feel better on the backhand or on the forehand). I feel completely confident on both wings. I don’t think there is anything on the market close to this for it’s probably the best racket I ever had. It’s perfect in every way. It suits both flat hitters like myself and spin junkies. My game suffered a big boost; I’m more aggressive yet more consistent as well. Don’t bother trying it or buying it because I need and will buy a couple more before this gem vanishes.